Sophie Matisse’s recent paintings mark a shift away from what she is best known for, which is convincing variations of paintings by famous artists, ranging from Leonardo and Vermeer to Pierre Bonnard and her great-grandfather, Henri Matisse. In those works, she removed what was the center of attention—that is to say, all the human figures. Her Las Meninas (2001) shows an empty room, Velasquez’s figures having presumably left. Despite the use of quotation, her paintings were neither ironic nor parodies. The missing figures evoked absence, longing, and the passing of time. We will all, one day, be absent. In her recent paintings, an awareness of time and absence continues as the central concern. The work is derived from the notebooks filled with small gouaches, often incorporating collage, which the artist has been making for years. In many cases, done while she is traveling, she began thinking of them as source material. In the gouaches, Matisse generally divides the surface into brightly colored, interlocking geometric shapes, which follow no overriding design. The curving and twisting froms range from solid blocks of color to atmospheric grounds, in which the color bleeds into the paper. Rather than quoting a well-known work, she seems to be riffing on the abstractions of Lyubov Popova and Joan Miro. These surfaces are the grounds upon which she affixes her collage elements, which compellingly confound the figure/ground relationship. 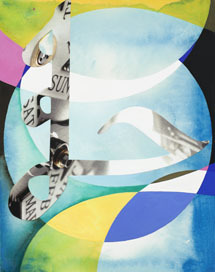 Matisse cuts her collage elements into Arabic or Farsi script. She has been studying Arabic, so she knows what the script means. (Although there are different dialects and manifestation of spoken Arabic that can be mutually incomprehensible, there is a single written language, a situation that is similar to the relationship between spoken and written Chinese). 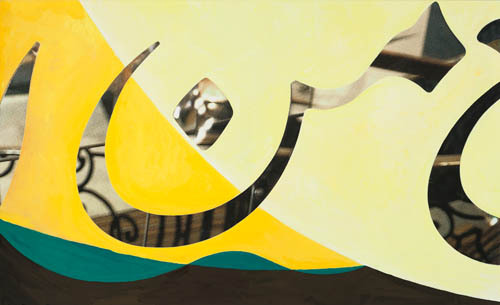 By incorporating language, Matisse expands the realm of seeing to include reading. Even though I am unable to read the script, I am aware that it is language and signifies something. In addition, the pictorial source for many of the collage elements is a glossy advertisement for a watch. This is where she folds into the work her consciousness of passing time. 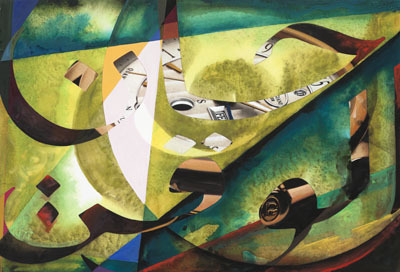 Because the collage contains a pictorial element, it interrupts the geometrically divided, abstract ground against which it is placed. The fluidity traversing the geometric ground seems excised by the pictorial elements—as if the viewer is peering through the ground. Consequently, we see the Arabic script, which to the untrained eye resembles a stylized gesture; we also read the numbers, for example, of the clock, printed on the collage element. This collision between seeing and reading reverberates throughout the work, especially when the artist enlarges the scale and translates the gouaches into paintings. The paintings attain their distinctiveness through Matisse’s way of fusing her consciousness of time to the work’s formal virttues. The other thing, and this is equally important, is that her recent paintings don’t look like anyone else’s. And that is saying a lot. In order to translate the relatively small gouaches to easel-sized paintings, Matisse uses a variety of means, ranging from the handmade to the mechanical. Despite her evident abilities as a painter, she isn’t a purist. 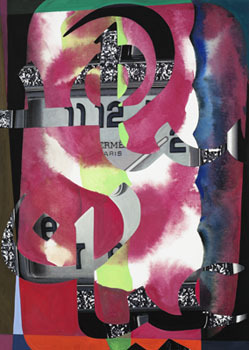 In the new works, she wants to preserve the photographic aspect of the collage element because it is essential to the viewer’ experience of the paintings. The friction between seeing and reading, the photographic and the painterly, and that which is done by hand and mechanically reproduced, is all part of the work’s meaning. 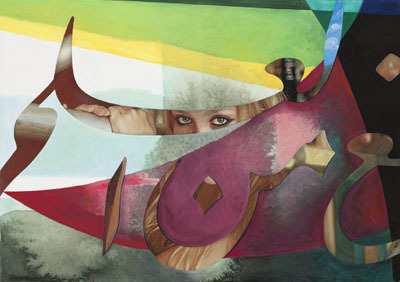 Beyond what the Arabic says, the curving script unravels the stability of the classic figure-ground relationship. This is because the pictorial element—a curving cutaway view of a watch—vies with the colored shapes and atmospheric grounds for our attention. 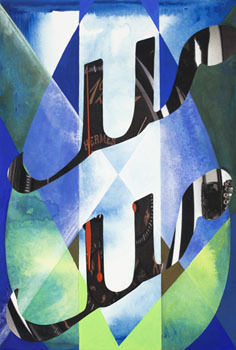 In some of the paintings, the “shadow” cast onto the gouache by the reproduced collage element introduces another form of disturbance into our experience of the work. 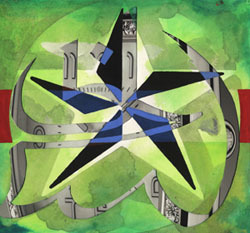 In Star, the artist conjoins Arabic Script, French (the word Paris), portions of a watch, a layered, largely green and yellow, atmospheric ground, and an abstract star made of five distinct blue-and-black triangles into a vibrant dance. Our attention constantly refocuses and reconfigures the interaction of these different vocabularies and forms of seeing the artist has layered together. Continuity and discontinuity become inseparable, as echoes link various elements together, while ruptures simultaneously separate them. Is it a stretch to think of these works as a commentary not only on time passing, but also on the interaction between divergent cultures, languages, and ways of perceiving? It was the Arabs, after all, who discovered zero and thus introduced infinity into our consciousness. The dance that the interaction of discordant elements sets in motion becomes the work’s meaning. We experience reality in glimpses and parts. Unexpected things fit together. We know they are meaningful, but we are not exactly sure we can deduce their meanings. At the base of all this is the interaction that Matisse establishes between figure and ground. By destabilizing the relationship, and compelling the viewer to constantly refocus his or her attention, the artist underscores both the unsteadiness of the ground we walk upon—our reality is always subject to disruption—and the constant conflict and intermingling that is basic to everyday life. There is a joyful cacophony to the vibrant colors—the mauves, dark blues, and strong reds—in which the collage elements are embedded. We’d better enjoy what remains of our lives while we can. Looking back at them will not necessarily get us anywhere, which is something that could be difficult, even painful to remember.